Catering for the TV viewing public | Where to next? Rio Branco may be in Brazil’s wild west, but it’s not too rough and tough for its residents to need their daily hit of soap operas. I think it was Eduardo in Curitiba who told us that unlike the US and its plethora of cop, forensics and blood-and-guts TV shows, Brazil’s airwaves are filled with soap operas. Almost everywhere we went in the country—cafes, barber shops, ice creameries, pubs—there was at least one TV showing the soap opera of the hour. But we were amused to see that Rio Branco takes the soaps to the streets. It took a couple of minutes for it to dawn on Poor John and me that the mobile roadside hot dog stands were simply an entrepreneur’s way of giving locals want they want—literally a TV dinner. We saw two of these stalls in a couple of blocks. They work like this. 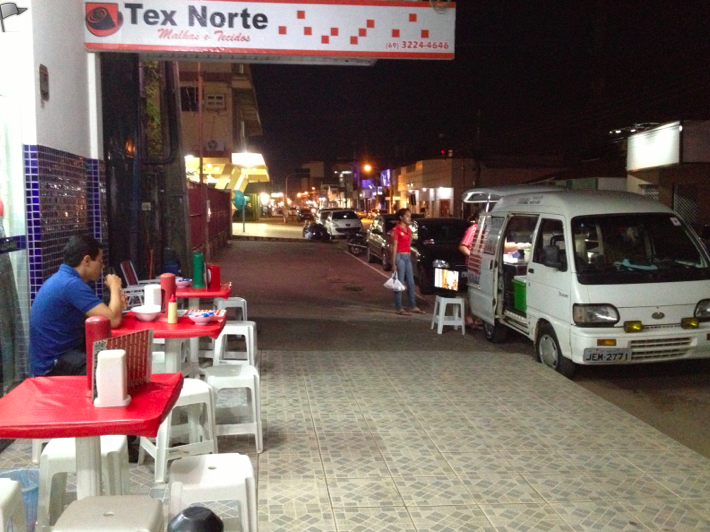 The seller parks his van and sets up a few tables and chairs on the pavement in front of a well-lit shop that is already closed. Condiments, napkins and menus are set out on each table. A TV is balanced on top of a plastic stool, plugged in somewhere nearby and tuned in to one of the soaps. The two stands we saw were tuned in to different programs. One had terrible reception, but still had customers (mostly men), so we assume people are faithful to a particular show. And in case you’re wondering, although we didn’t watch much TV in Brazil, we never saw anyone get shot. I can imagine you and Poor John having recurring roles on As the World Turns. When are you guys passing through Dallas, again? Soon, I hope. I promise nobody will get shot. Good one Potsie! We’d have to stay in one place for a while to have roles on a soap opera. As for Dallas, maybe 2014, and you promise we won’t have to watch CIS, Law and Order or Hawaii Five 0? I promise. No crime dramas! Maybe some episodes of Antiques Roadshow. We can do Antiques Roadshow. But has anyone ever pulled a sharp letter opener on another person on the show? The idea is hillarious, but witty.. well, in a way. 🙂 Thank you for sending the breeze of Brazil, I love reading about it, it is on my travel bucket list. Kubra, Brazil is brimming with enthusiasm. I’m sure you’ll love it when you get there.